A few months back Robby and I were up way too late glued to the Food Network. We were watching "The Best Thing I Ever Ate"....have you seen that show?? All your favorite chef's from the Food Network talking about their favorite foods. It's pure torture I tell you. Ina Garten, aka the Barefoot Contessa, talked about her favorite grilled cheese sandwich from E.A.T. in New York. As good as the sandwich looked (gruyere on sourdough! ), I haven't stopped thinking about the peasant soup she had to go with it. I have searched recipes to find one that looked similar to this bread filled (BREAD FILLED!) soup, and finally decided to go with Mario Batali's recipe (with a few tweaks....I roasted the tomatoes, added a red pepper, and added milk). If you are like my friends in California who still have tomatoes coming from their garden (I hate you), or if you're like Hayley who will have a flourishing garden by Christmas, or maybe you're like me and still have green tomatoes ripening in a box downstairs.....this recipe is perfect! Place garlic, tomatoes, and pepper on a lined baking sheet, drizzle with olive oil, and roast at 400° until fork tender--around 30-45 minutes. Add puree to large pot on medium heat. Stir in water and milk. Using a wooden spoon, add the stale bread chunks. Continue simmering until all the bread has absorbed as much liquid as possible, yielding a baby food-like consistency. Season, to taste, with salt and cracked pepper. Let the soup continue simmering for 10 more minutes, then serve immediately in warmed soup bowls. Mario topped with fresh parmigiano-reggiano, we loved it with smoked gouda and basil. 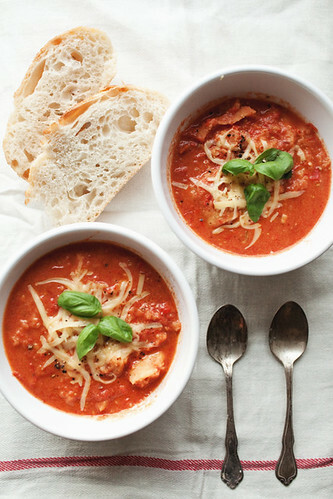 tomato soup is my favorite so this makes this a must try! I love that show and yes it is pure torture! This soup looks amazing and can't wait to give it a go, will go great with the really cold weather we are having right now! gosh! that looks so amazing. but i'm too lazy to try to roast my own tomatoes and garlic. Mmm I know I will like this. Tiffany's roomate works at Paradise & I asked her if their tomato soup was mostly cream. It is. So this sounds like a lighter version, which I need. Thanks! Just want to say I recently discovered your blog, and I love it! And I love the title of your blog: the little red house. I read the children's book of the same name, as you probably already know, since you picked the name of your blog! But I loved the book, so I thought it was great to see that name on your blog. As well as the picture of the little red house. Very cute. Wow, beautiful photo! I just ran out of my ripening tomatoes from the Summer garden (bummer), but will have to make this next year! With the weather getting cooler I could definitely curl up with a cup of soup and a great book! Thanks for sharing! I absolutely love Best Thing I Ever Ate! This soup definitely looks delicious! I love rustic soups like this... so much better than anything from a can! Bookmarked. This looks amazing! I absolutely love tomato soup.. and I'm always looking for ways to use up leftover bread. Do you think I could make this without a food processor? My husband and I love Best Thing I Ever Ate! We also love tomato soup and a good panini to go with. I am going to have to make this, thanks for the recipe! Do you peel the tomatoes before roasting them or do you peel them after? Thank you! Love all your recipes, can't wait to have this for supper tonight!